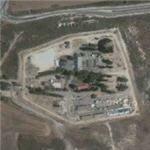 Camp 1391 is a controversial Israel Defense Force prison. The existence of the camp and its inmates was completely unknown to the public until 2003 and details of its nature are still not entirely clear. The camp was accidentally discovered by an Israeli historian called Gad Kroizer. He stumbled on a 70-year-old map drawn by a government architect while researching old British police buildings. He found on the map 62 British police compounds in Palestine in the late 1930s and early 1940s where both Arab and Jewish militants against the British occupation were interrogated. A camp called Meretz did not appear on any of the modern Israeli maps. Kroizer started digging deeper and in 2004, he unveiled Camp 1391 to the public and the next day he received a phone call from Israel's military censor who wanted to know why the article had not been submitted for inspection. It is situated in Israel's North District near Pardes Hanna, less than an hour's drive from Tel Aviv and close to Highway 65 between Hadera and Afula. The HaMoked, an Israeli human-rights group, has petitioned the High Court of Justice to close it down.